NOTE: Before purchasing, check with your instructor to ensure you select the correct ISBN. Several versions of Pearson's MyLab™ products exist for each title, and registrations are not transferable. To register for and use Pearson's MyLab products, you may also need a Course ID, which your instructor will provide. If purchasing or renting from companies other than Pearson, the access codes for Pearson's MyLab products may not be included, may be incorrect, or may be previously redeemed. Check with the seller before completing your purchase. For courses in College Algebra. Bob Blitzer continues to inspire students with his engaging approach to mathematics, making this beloved series the #1 in the market year after year. Blitzer draws on his unique background in mathematics and behavioral science to present a wide range of vivid applications in real-life situations. Students of all majors stay engaged because Blitzer uses pop-culture and up-to-date references to connect math to students’ lives, showing that our world is profoundly mathematical. With the new edition, Blitzer takes student engagement with the mathematical world to a whole new level drawing from applications across all fields as well as topics that are of interest to any college student (e.g., student loan debt, grade inflation, sleep hours of college students). Applications are also brought to life online in a new, assignable video series that explore the entertaining and mathematical Blitzer Bonus boxes. The new edition also aims to help more students to succeed in the course with just-in-time support in the text--such as Brief Review of prerequisite topics, Achieving Success boxes, and Retain the Concepts exercises--as well as support within MyLab™ Math such as new concept-level videos, assignable tools to enhance visualization, and more. MyLab™ Math is an online homework, tutorial, and assessment program designed to work with this text to engage students and improve results. Within its structured environment, students practice what they learn, test their understanding, and pursue a personalized study plan that helps them absorb course material and understand difficult concepts. The new edition continues to expand the comprehensive auto-graded exercise options. In addition, MyLab Math includes new options designed to help students of all levels and majors to stay engaged and succeed in the course. NOTE: This package includes a MyLab Math access kit created specifically for Blitzer, College Algebra 7/e. 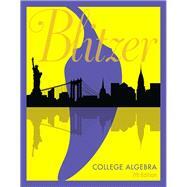 This title-specific access kit provides access to the Blitzer, College Algebra 7/e accompanying MyLab course ONLY. Bob Blitzer is a native of Manhattan and received a Bachelor of Arts degree with dual majors in mathematics and psychology (minor: English literature) from the City College of New York. His unusual combination of academic interests led him toward a Master of Arts in mathematics from the University of Miami and a doctorate in behavioral sciences from Nova University. Bob’s love for teaching mathematics was nourished for nearly 30 years at Miami Dade College, where he received numerous teaching awards, including Innovator of the Year from the League for Innovations in the Community College and an endowed chair based on excellence in the classroom. In addition to College Algebra, Bob has written textbooks covering developmental mathematics, introductory algebra, intermediate algebra, trigonometry, algebra and trigonometry, precalculus, and liberal arts mathematics, all published by Pearson. When not secluded in his Northern California writer’s cabin, Bob can be found hiking the beaches and trails of Point Reyes National Seashore and tending to the chores required by his beloved entourage of horses, chickens, and irritable roosters.